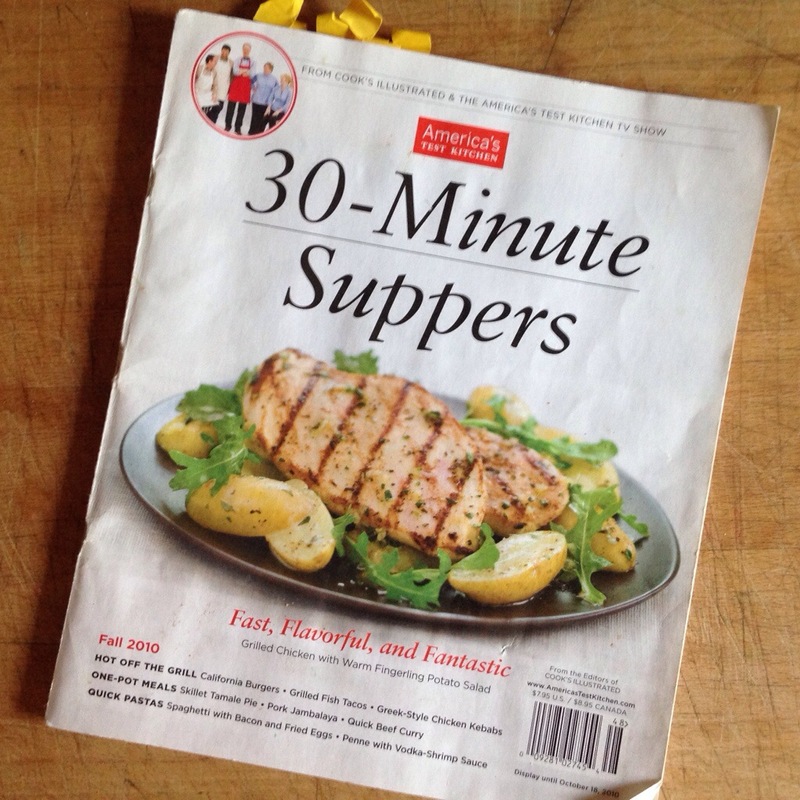 I bought this recipe magazine on a whim 4 years ago while waiting in line at the supermarket, and it quickly became my most-used recipe book in the summer and fall. Every recipe I have made (and I have used almost all of them) have been fantastic. And they are super quick and easy. So, since I use this blog as my virtual recipe box and menu planner (along with Pinterest, of course), I thought I would post some of my favorites from the magazine, just in case someday it catches on fire from being too close to a burner, or accidentally gets dropped in the dishwater. Plus, you should try out these recipes, too! They’re great for a quick, easy and flavorful weeknight meal. I’m starting with the steak and zucchini tostadas. I don’t make these as often because we really don’t eat steak all that much (small business owner budget), but I have made this substituting lentil taco filling for the steak and it is also pretty good. My favorite lentil taco filling recipe is sort of a mash-up of my own taco seasoning and the lentil taco recipe from Budget Bytes. Actually, I keep the lentil taco filling on hand in the freezer for whenever we have tacos, so I have it ready for my vegetarian son on taco nights. 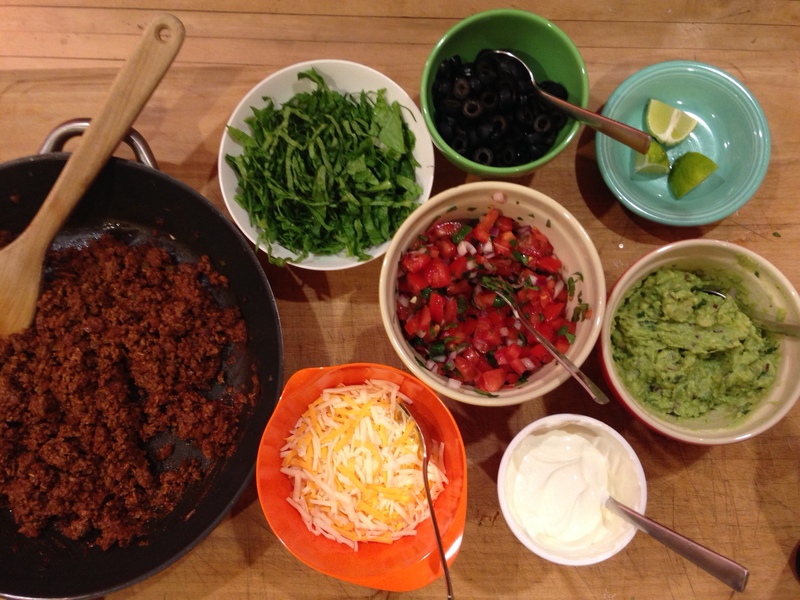 But I digress….try these tostadas on your next taco night, you won’t be sorry. Zucchini and steak is a great combo! **To make this even quicker, you can buy already made tostada shells at the grocery store if your store carries them. Here in Chicago there are a couple of different local brands that make them, and you can find them in the “Mexican” aisle. 1. Adjust oven racks to lower-middle and upper middle positions and heat oven to 450 degrees. Brush both sides of tortillas with 2 tablespoons oil and season with salt and pepper. Lay tortillas in single layer on 2 baking sheets. Bake until golden brown and crisp, rotating baking sheets and flipping tortillas halfway through, about 10 minutes. 2. Meanwhile, pat beef dry with paper towels and season with salt and pepper. Heat additional 1 tablespoon oil in large skillet over medium high heat until just smoking. Cook beef until well browned and it registers 125 degrees (for medium-rare), 4 to 6 minutes per side. Transfer to cutting board and tent with foil. 3. Add remaining oil and zucchini to skillet and cook until tender, about 4 minutes. 4. Cut beef in half lengthwise, then very thinly slice beef crosswise against grain. 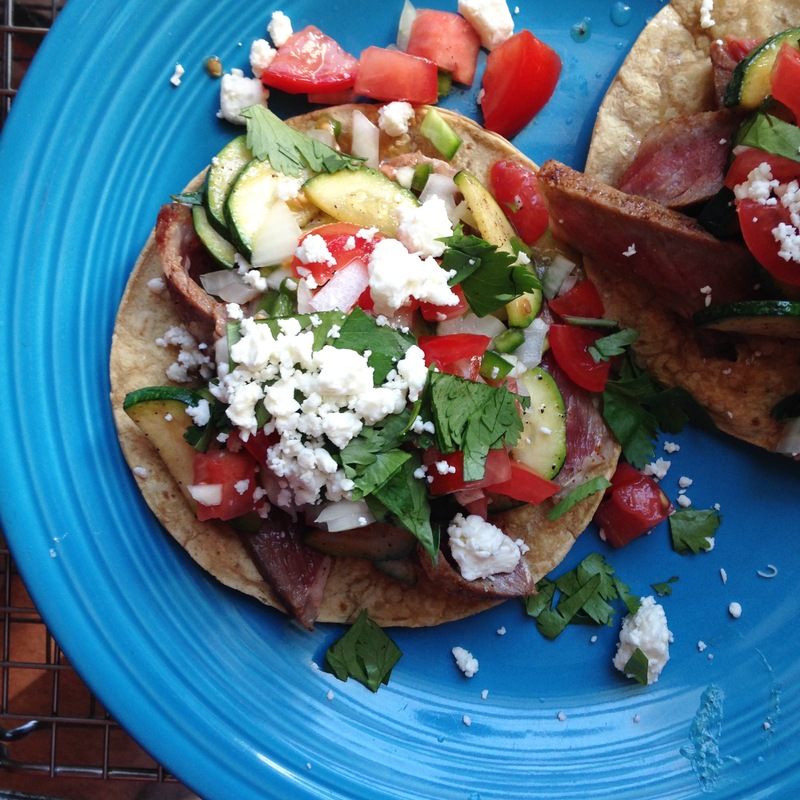 Divide beef and zucchini equally among tostadas. Top with feta and cilantro. Serve with lime wedges and pico de gallo. Combine all ingredients in a small bowl. Season with salt and pepper. I’ve been making my own taco seasoning ever since I discovered the recipe in my Joy of Cooking that Aunt Suzy gave me back in 2001. I never loved the super salty McCormick packets that we always used before, and was super excited in my early cooking years to discover how easy it is to make yourself. I almost always have taco seasoning stuff on hand, and it takes less time to make the meat and/or beans part of the tacos than it takes to prepare everything else. Now that we have a vegetarian in the family, I make meat for us and season a can of black beans in almost the same way for him, basing it on this fabulous recipe that we posted about last summer. I also almost always make homemade guacamole, because Desi decided he only likes avocados in that form anymore (we used to just put chopped up avocados on our tacos). I use this recipe because it keeps longer and tastes better with all the lime juice in it. I also make pico de gallo (recipe below) instead of just plain chopped up tomatoes. It’s better that way, and then we can eat the leftovers the next day on tortilla chips for an after-school snack. Our other fixings are shredded lettuce, shredded cheese, sour cream, taco sauce (not really needed, if you ask me…but hubby and son love the stuff), and black olives. I know, it’s weird, but it’s what I grew up putting on my tacos, and one of the reasons Desi loves tacos so much. YES, we love tacos up here in the Northland also! A few comments: We often do veggie tacos with seasoned beans, but Randy also makes the taco filling with Tempeh as a substitute for the meat. He breaks it up into small chunks and toasts it in a skillet with a little oil and whole cumin seeds to get it crispy. This helps it keep its shape and texture when added to the sauce with seasonings and onions. We also like diced zucchini and shredded carrot with these traditional style tacos. We often serve doctored up refried beans as a side. So Margaux . . . does your family like soft tortillas or crispy taco shells? For us, corn is a must – no flour tortillas for these – and we go back and forth on soft or crispy! 1. Heat oil in a medium skillet over medium heat until shimmering. Add onion, and cook, stirring often, about 4-5 minutes. 2. Increase heat to medium-high and add the meat. Cook, breaking up the meat with a wooden spoon, until no longer pink, about 3 minutes. 3. Stir in the garlic, chili powder, cumin, coriander, anise and salt. Cook, stirring, for about 30 seconds, until fully incorporated and fragrant. 4. Add tomato sauce and minced peppers. Cook, stirring occasionally, over low heat for 10 minutes. Seed and chop 2-3 Roma tomatoes, 1/4 red onion, and cilantro. Seed and mince half an jalepeno. Mix all in a small bowl together, with a squeeze of lime juice. My friend, Ruth, and I recently read My Life in France by Julia Child and thought it would be fun to cook some things inspired by her. . . maybe not exactly her recipes from The Art of French Cooking, but similar ones using fresh seasonal ingredients. We had talked about a souffle, but I’ve always been intimated by them. 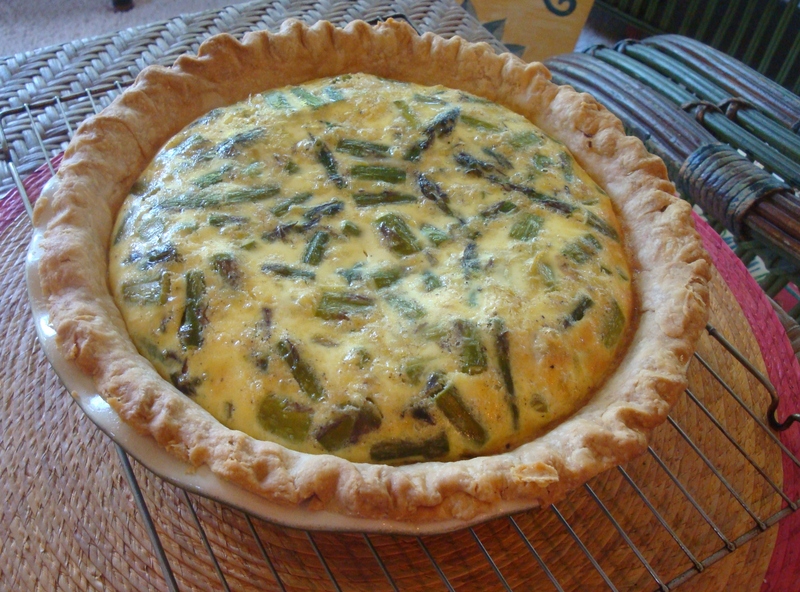 Probably should give one a try at some point, but we decided on quiche and chose an asparagus quiche because asparagus is at its peak right now. I did look in TAOFC to see whether Julia had a recipe using asparagus (no) and to see her methods (interesting and helpful!). Ultimately, we chose this recipe from Martha Stewart that we modified slightly. I know the perfect person to buy from at the Minneapolis Farmer’s Market, so we went Saturday morning to buy asparagus and other items for our menu. I realized that while I enjoy ordering quiche out or having it at other people’s homes, I had never made one myself! 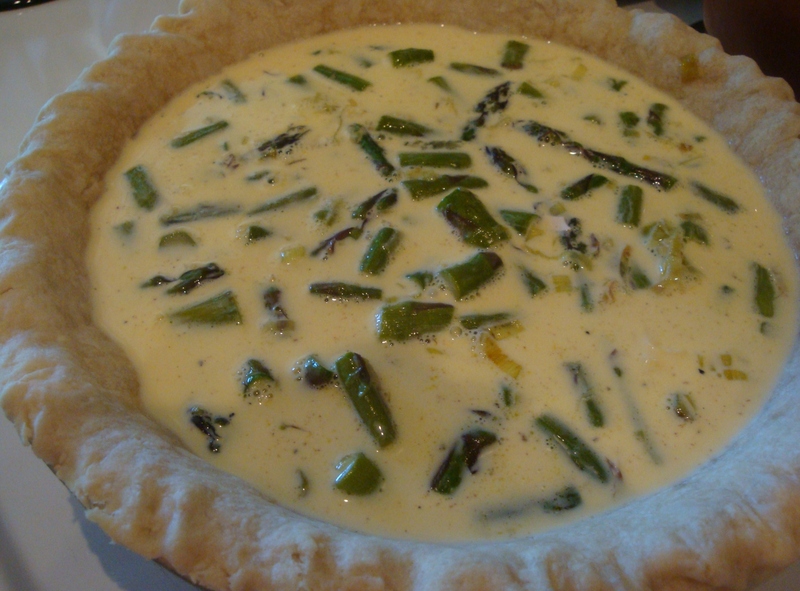 This was very easy and definitely delicious, so I will make quiche again, experimenting with other types and recipes. It was fun to cook with friends, with everyone diving in and making light work of the tasks. We served this with a beautiful salad and a glass of chardonnay. Quiche is kind of a staple in our house. My dad made quiche a lot when I was a teenager, so it’s like comfort food to me. And it’s (relatively) easy, inexpensive (especially if you just use leftover stuff like I do a lot), and really delicious. This recipe is definitely a little fancier than I usually make, with the Gruyere and leeks, and it’s super good. We usually have a few leftover pieces for breakfast the next day, but this one we totally polished off that night! When I make quiche, or any baked single-crust pies, for that matter, I use the Joy of Cooking method with the crust, and I find that it always makes for a better finished pie. In the Joy of Cooking test kitchen, this was the only way they found that didn’t end in a soggy, under done crust. The edges may get a little brown, but it’s totally worth it. I’ve included the instructions for this method after the recipe. Crust: Roll out the dough and place in a 9-inch pie plate. Crimp or flute the edges. Bake at 350° for 7-8 minutes. Remove from the oven and make a few stabs with a fork to deflate any bubbles. Set aside to cool slightly. Leave the oven on. (Or follow Margaux’s instructions below for pre-baking the crust). Vegetables: Wash the asparagus and pat dry. Cut in roughly 3/4-inch lengths. Cut the tops off the leeks so only white and light green part remains. Slice these pieces in half lengthwise and wash thoroughly under running water, fanning out the layers. Thinly slice in half moons then pat dry with a towel or paper towels. Heat the oil in a non-reactive skillet over medium heat. 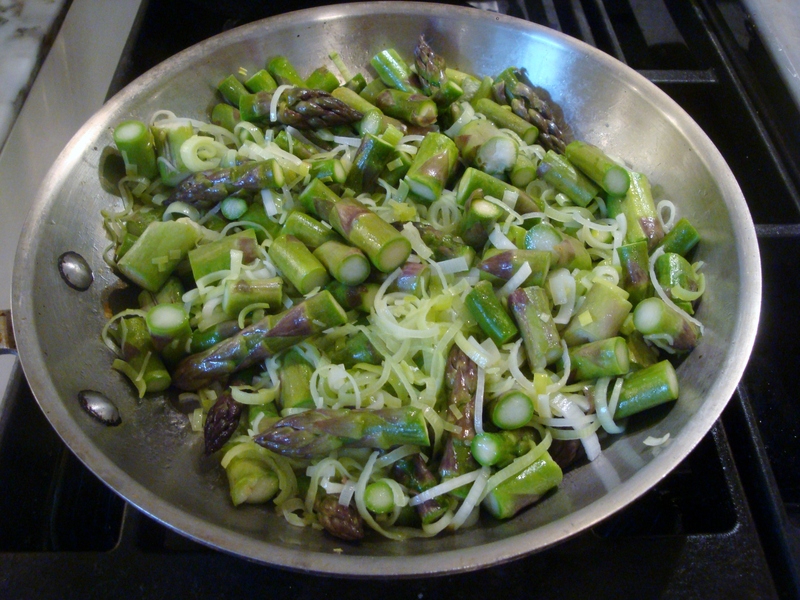 Sauté for about 10 minutes until asparagus is beginning to soften and the leeks show a few browned bits. Remove from heat and set aside. Eggs: Whisk the eggs and half and half together and add the nutmeg along with salt and pepper to taste. Whisk to completely blend and emulsify a little. Assembling and baking the quiche: Place the slightly cooled pie crust on a jelly roll sheet pan. Scatter the grated Gruyere onto the bottom of crust. Place the vegetable mixture in a layer over the cheese. Next pour the egg/cream mixture over all. Place the quiche on the sheet pan in the center of the oven and bake for 45 to 60 minutes. (check at 45 just in case it’s done. At Ruth’s it took an hour in a gas oven and at my house it took 45 min in an electric oven.) A knife inserted into the center should come out almost clean. The quiche will continue to cook slightly as you let it rest for 15 minutes (or more) before serving. You can serve warm or room temperature. Suzy says…None of us had time to make a crust so we used store bought and it was fine! While I swear by homemade, I have friends who swear by store-bought. Today I was convinced that if pressed for time purchased crust is a good option. On the recommendation of the cheese department manager, I used half local Gruyere and half imported French. Her idea was that the French is nutty and flavorful, but not very “melty” and the local is very melty, but does not have as much flavor as the French. If Gruyere isn’t readily available, you can use regular Swiss cheese. Roll out your dough and place in pie dish. Crimp the edges as desired, and freeze for about 8-10 minutes. Meanwhile, preheat the oven to 400 degrees and set a rack in the upper third of the oven. Take the pie dish with crust out of the freezer and smooth a large sheet of aluminum foil, shiny side down, into the pie crust, leaving an overhang all the way around the edges. Fill the liner with raw beans or rice or metal pie weights, banking the weights along the sides if you don’t have enough to fill the whole shell. Bake the crust for 20 minutes with the weights in to set the crust. Take out of the oven, carefully remove the foil by grabbing the corners and pulling it out with the weights, then prick all over with a fork. Put it back in the oven for 5-10 minutes, until its golden brown. Check periodically for doneness and if there is any puffing up, prick the puff with a fork and gently push back in place with a spoon. Take out of the oven and fill with the filling and bake (don’t forget to turn the oven down to 350). If your crust edges start to get too brown during baking with the filling in, carefully cover just the edges with aluminum foil pieces. Or get a vintage crust saver (aluminum ring that you set on the crust) like I have…it’s great! My blog partner and I are looking for uses for leftover chicken or turkey these days, something we seem to regularly have on hand from roasting or stewing a chicken. . . or maybe buying a rotisserie chicken. I was looking for a chicken enchiladas recipe last week and was on The Homesick Texan blog when I ran across this taco recipe. It attracted me because it doesn’t use cheese, a ubiquitous ingredient in enchiladas, and looked unbelievable easy to make, which it was. It’s one of those recipes where you throw all the ingredients into a blender, heat the blended sauce up and then add chicken. What could be simpler? Oh, and did I mention these tacos are delicious and fun to eat? We served with amped-up Spanish rice and orange-avocado salad. 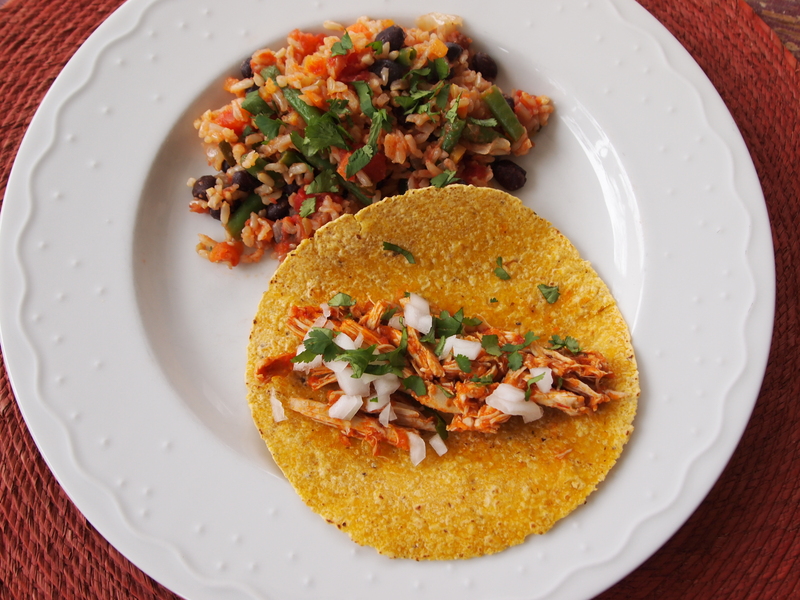 Both the taco and Spanish rice recipes make a lot, so I’ve been enjoying for lunch. I think you could also freeze both of these for future meals. Place all ingredients up to the canola oil into a blender. Blend until smooth. Place the canola oil into a medium saucepan on medium heat. Once heated, add the blended sauce. Bring to a simmer and cook uncovered for about 10 minutes, until it is a little darker and thicker. Add the chicken and stir to coat and blend and then keep on a medium burner until heated through, about 10 minutes. Ready to assemble! 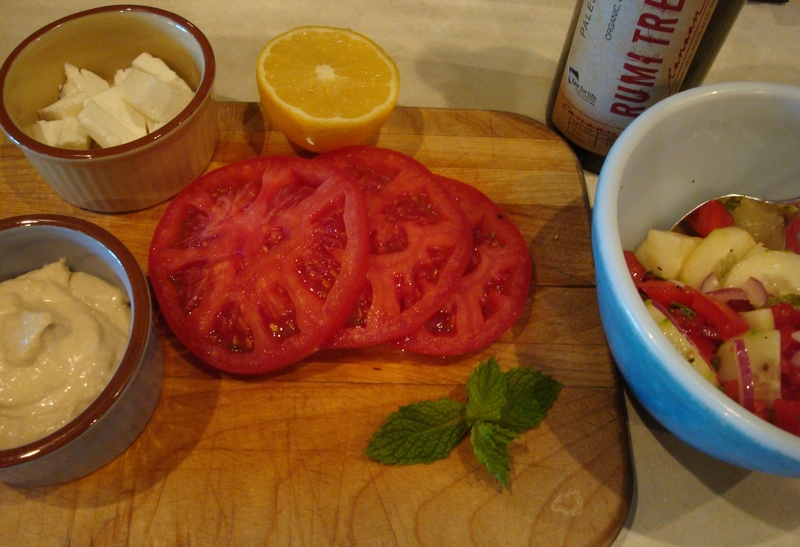 Other favorite toppings – maybe avocado, tomatillo salsa, radishes, etc. Place tortillas in foil and heat in the oven at 300 for 5 or so minutes until warm. For thin tortillas, you will want to use 2 per serving. Otherwise, for each taco, place chicken on a tortilla, top with your fave toppings and squeeze a little lime over all. COOK’S NOTES: I just noticed on The Homesick Texan that she says 4 servings. 4 servings!! That would be for people who are going to eat 5 tacos per person :-). I think this makes enough chicken for at least 20 tacos given how many we’ve eaten and how much chicken is left. This recipe could be made kid-friendly with no or 1 chipotle pepper, then adults could pass the hot sauce. If you omit the chipotle peppers, I recommend you add 1-2 teaspoons smoked paprika. We like to use sprouted corn tortillas from Food for Life. They are thicker, healthier, GF and have an intense corn taste. For the chicken, you can use an entire stewed or roasted chicken or chicken parts. I roasted 2 fairly large breasts and 4 legs (all bone-in/skin-on) and they were the perfect amount. To shred, I just pulled/broke the meat apart with my hands. You can also do this with 2 forks. The most recent Bon Appetit is chock full of what look to be fabulous things to cook and bake, so I thought I’d better get started. This recipe contains only a few ingredients and none of the usual suspects of garlic, onions or shallots so I was curious about the flavor profile of the finished dish. I kept thinking “I should have added some garlic!” as I was cooking this, but am glad I didn’t – it is a WOW with many layers of flavor. The added bonus is that it was a snap to make! We served it with roasted chicken breasts and a green salad, but I can also see it as a first course or a vegetarian main dish. An Italian Pinot Bianco was a perfect wine pairing. Cook the farro: Place farro in a saucepan with the water. Bring to a boil, reduce heat and simmer for 30 or so minutes until water is absorbed. Place in a large bowl to cool. Set aside. Make the dressing: Whisk mayo, mustard, lemon juice and 4-5 tablespoons olive oil in a small bowl until emulsified. Season with salt and pepper and set aside. Cook the cauliflower: Place 1 tablespoon of the olive oil in a large skillet over medium heat. Add the cauliflower when oil shimmers. Cook for 10-12 minutes, uncovered, until browned in places, turning occasionally. Add 2 tablespoons water, then cover and cook for 5-8 more minutes until the cauliflower is tender. Remove from heat and season with salt and pepper. 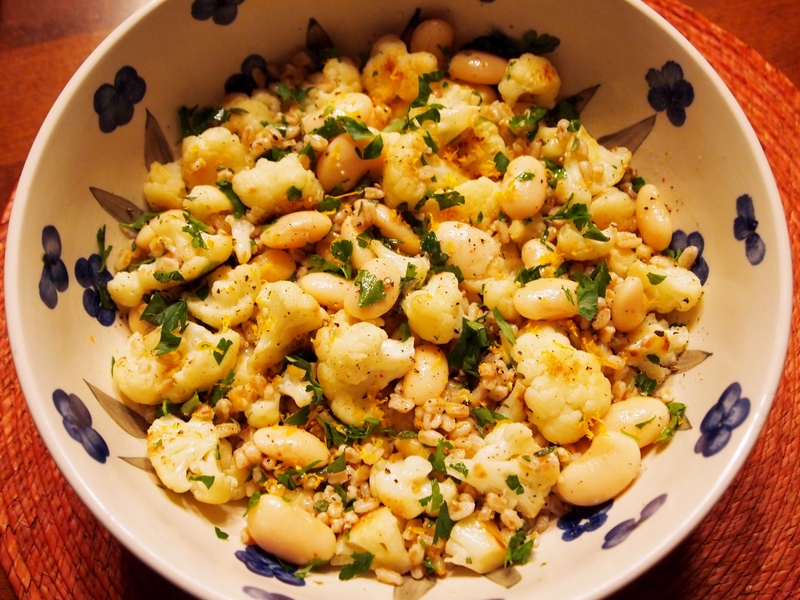 Assemble the salad: Turn the cauliflower, while still hot, into the bowl with the farro. Add the butter beans and stir to combine. Add the dressing and stir to thoroughly blend. Next add the parsley, oregano and lemon zest and toss to blend all ingredients. Enjoy! COOK’S NOTES: I adapted the BA recipe in a few ways. The original recipe called for barley, but I had farro on hand so used that. I think it would be good with either and possibly brown rice. I also used less mayo than called for and believe it could be made without it altogether. Also called for was tarragon, which I didn’t have so I substituted fresh oregano – I’ve been looking for uses since our plant is doing really well in the house this winter. I found the canned butter beans locally at Whole Foods – it took some searching! This dish is a “Wow!” in so many ways. First and foremost, it’s delicious! But also easy, with a minimum of fuss. I made a few adaptations from the original recipe in Bon Appetit. 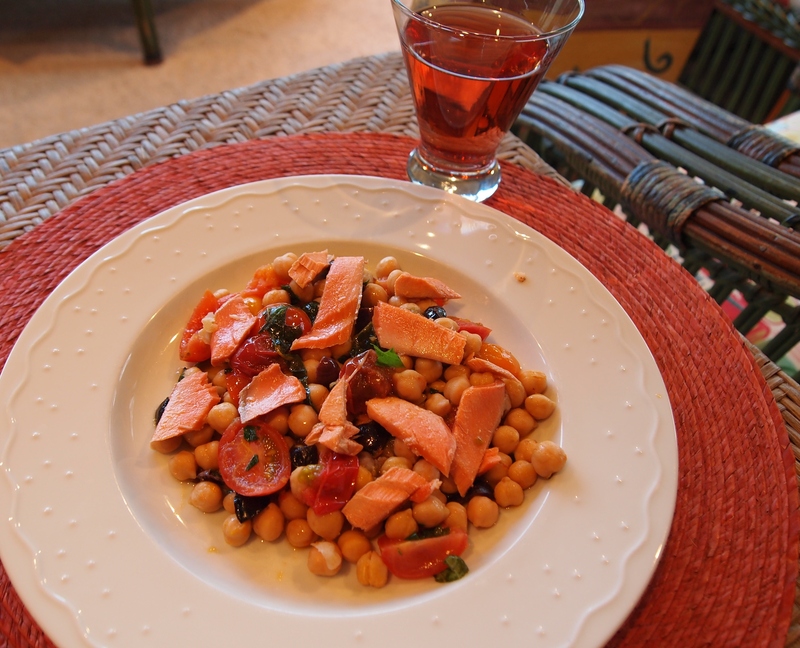 This is also a great option for use of leftover cooked salmon instead of cooking the salmon specifically for this dish. You can see that we enjoyed it with a French rose wine, which was a perfect complement. We served it with this favorite quinoa salad, Lemony Quinoa with Crunch, which also was a great companion. The whole meal screamed spring, although I can’t wait to make it later in the summer when tomatoes are in season! Pre-heat the oven to 450° and place the oven rack in the top 3rd of the oven. Line a baking sheet with foil. Coat the salmon with a thin layer of olive oil. (If using farm raised salmon, you can skip this step.) Press the garlic through a garlic press and spread over the salmon, then season with salt and pepper. Bake in the oven for 8-12 minutes, depending on thickness of the salmon, until salmon is medium rare (or to your desired doneness). Cool slightly and then remove the skin and dark layer of flesh. Set aside. Heat the olive oil in a large skillet or saute pan over medium-high heat. Add the chickpeas and remaining ingredients except basil. Stir until tomatoes start to soften and the juice has thickened, 5-7 minutes. Season with salt and pepper and stir in the basil. Place desired quantity of salad on individual serving plates. Tear salmon into 1- to 1 1/2-inch pieces and scatter over the salad. Can be served warm or at room temperature. I’ve been on the lookout for summer sandwich ideas beyond the usual BLT and burgers on the grill. Not that I don’t like those, but variety is the spice of life after all! This sandwich was inspired by a recent NY Times “Recipes for Health” recipe. I made a few adaptations – I thought this called out for a pita pocket vs. the english muffin specified in the recipe, for example. The sandwich uses the bounty of summer so if it looks good to you, don’t wait till the season is over to make it! Slice one of the tomatoes and set the slices aside. Dice the other tomato, removing seeds and extra juice. In a small bowl, combine the diced tomato, cucumber, onion and mint. Stir in the lemon juice, vinegar and olive oil. Season to taste with salt and pepper. Place the pita bread in foil and heat in a 350° F oven for about 5 minutes until warm. Cut the pitas in half and open the pockets. 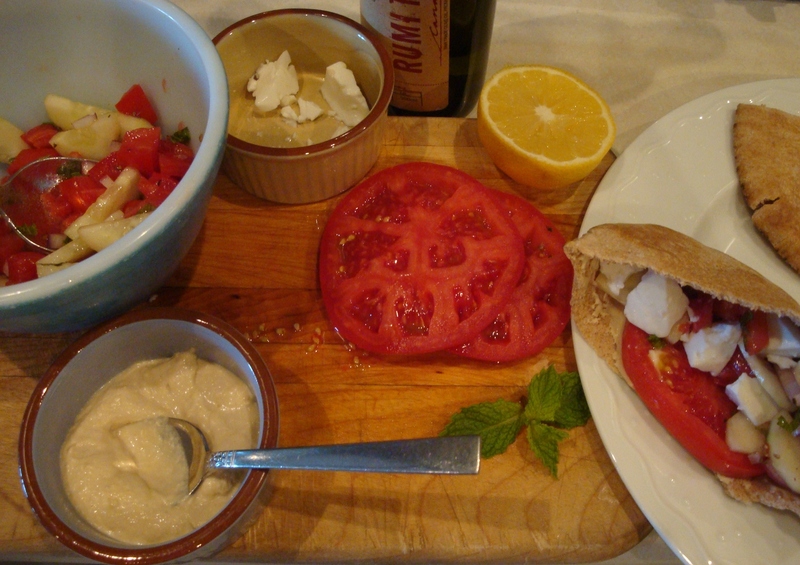 Spread the bottom of each half with the hummus. Place a slice or two of tomato on top. Top with the tomato mixture and then add the feta cheese. Yum!